The second poem of the year comes this week. March has been about the self. Last week, I asked what could you do to help the other members of your tribe or forest. 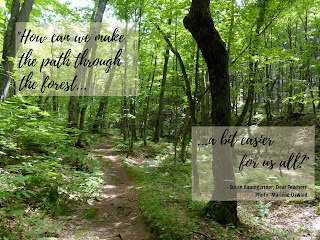 This week is a request to remember who helps you navigate the forest. This poem had an extra layer of meaning to me as I read it this morning, after watching the March for Our Lives marches and speeches around the world. The student activists have to be flying on adrenaline right now. “There are times when we feel unstoppable.” They’ve acknowledged the people who have come before them and who are helping them today. “It’s a rare one, however, who can do it alone.” They spoke from a variety of religions, ethnicities and experiences, both offering and receiving empathy. 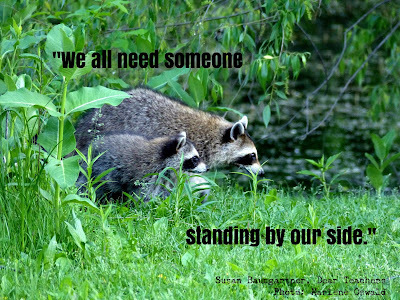 We all need someone standing by our side. Do we recognize them all? It pays to consider who we feel is by our side. Who we feel we need by our side. Who might be by our side but we don’t realize are. Who we might also consider asking to be by our side. 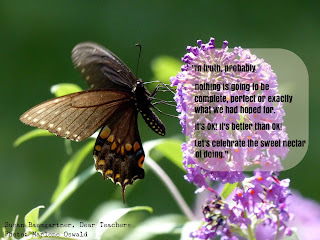 In this week’s essay, I wanted to draw a comparison between our lives and a natural ecosystem. I hoped to offer reminders that we exist in conjunction with a host of other people and things. In the book I’m currently working on, Dear Warriors, I’m diving deeper into this analogy. Marlene’s photo and my thoughts in this essay were among the initial inspirations that I’ve looked to. The term “warrior” has been used a lot recently to describe people with type 1 diabetes, which is the target audience for my new work. I’m exploring the definition of “warrior”, which can have an extremely violent and hostile connotation today. I’m convinced we can reclaim the meaning of “warrior” to describe all people and in a completely different way: hard-working, team-oriented, resourceful and creative-thinking.The “noble warrior” or “spiritual warrior” dealing with general hardship and strife, as it were. I’m equally convinced we can also compare ourselves to trees, as in this shot. We all need to take care of ourselves. "the times i am most proud of myself are the times in which i gave and shared more than i thought i had, gave more than i thought i could, loved harder than i thought i cared to. "I love the sentiment of this, however, I know many amazing people who have truly drained themselves into a pit of exhaustion & sense of loneliness with this practice: #teachers. We all need to support each other." 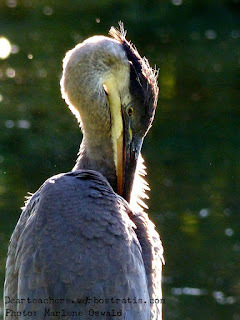 This was the first heron image of Marlene’s that inspired the first draft of Week 26: Ode to Self in Dear Teachers. I wasn't able to use it in the book, but I wanted to share its softness and tranquility today. The blurred background of Monet-like water makes me settle and relax. I imagine hot sun and pulsing insect choruses filling the thick summer air, lulling me- slowing me. Add a little Relaxing Music 101 from Google Play, and it's magic. Twitter is loaded right now with reminders from teachers to teachers, pleading with each other to take care of themselves. Now is when exhaustion from over-extension can peak.